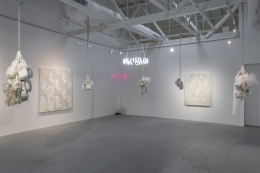 Installation view of "Let Her Rave"
Gavlak Los Angeles is pleased to present Let Her Rave, an exhibition of new work by Brooklyn based artist Zoë Buckman. 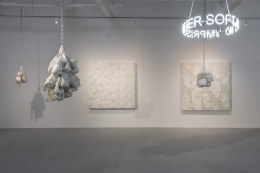 This is the artist’s first solo exhibition with Gavlak and coincides with the unveiling of her first public sculpture at The Standard hotel in West Hollywood, produced by Art Production Fund. Zoë Buckman is a multi-disciplinary artist best known for her politically charged sculptures, installations and photographs. Rooted in activism against social constructs that historically and presently oppress women, her works straddle a delicate balance between notions of: masculine and feminine, industrial and handmade, craft and “high” art, personal and collective, explosive and restrained. The artist thoughtfully develops this balance in order to make her work accessible to both men and women and promote a dialogue about the underlying issues of gender equality, and the safety of violence against women and girls. The ode offers an exaggerated explanation of how a man should cope with grief, suggesting that he seek out beauty in all objects and do so by objectifying a woman. A longtime admirer of Keats’ poetry, Buckman struggled to see past this antiquated notion of female subjection and roles of women in society, using it as a revisionist platform and feminist “call to arms” for her work. 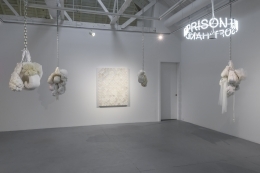 This takes the form of two neon text works that literally highlight Keat’s words in striking red stating “let her rave.” A white neon sculpture entitled Ring, reads “imprison her soft hands” in the shape of a circle, referencing an unbreakable bind, a wedding ring, and patriarchal society’s expectations that women be pure and chaste. Also for the exhibition the artist created a series of hanging boxing glove sculptures made from worn wedding dresses. The soft silk and lace intricately sewn onto boxing gloves and suspended from a metal chain juxtapose notions of demure and delicate feminine sensibilities with the strong, feminist fighting for equality. In addition, one notices how the textiles are stressed and bursting at the seams, further challenging the notion of female confinement. This is formal tension of materials also appears in Buckman’s three “paintings” quilted into geometric patterns using the worn wedding gowns stretched like a canvas. By employing a “lower” art form of craft, the artist elevates the traditional female practice transforming it into minimalist painting associated with the male modernist canon. Zoë Buckman (b. 1985 Hackney, East London) studied at the International Center of Photography, New York, NY. 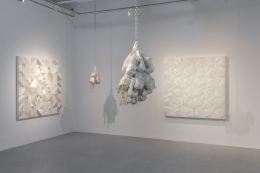 Her work has been shown in solo exhibitions including at Project for Empty Space, Newark (2017); PAPILLION ART, Los Angeles (2016); and Present Life at Garis & Hahn Gallery, New York (2015). Buckman was recently included in group exhibitions at Paul Kasmin Gallery, New York (2017); GAVLAK, Los Angeles (2017); and Fort Gansevoort, New York (2017). Buckman was a featured artist at Pulse Projects Miami 2016, and Pulse Projects New York 2014, and was included in the curated Soundscape Park at Art Basel Miami Beach 2016. The artist completed an artist residency at Mana Contemporary, and was awarded an Art Matters grant in 2017. Public works include a mural, We Hold These Truths To Be Self-Evident, in collaboration with Natalie Frank at the Ford Foundation Live Gallery of New York Live Arts in the neighborhood of Chelsea, and Champ, an outdoor version of her neon sculpture of the same title, done in partnership with Art Production Fund and The Standard Hotel. Champ is currently on view in Los Angeles on Sunset Boulevard, through February 27, 2019. A reception will be held for the artist on Saturday, March 3rd, from 5:00 – 8:00 pm, with an artist walkthrough at 6:00pm, at GAVLAK Los Angeles (1034 North Highland Avenue, Los Angeles, CA 90038).